The steady growth of Tuscan Lakes in League City has led D.R. 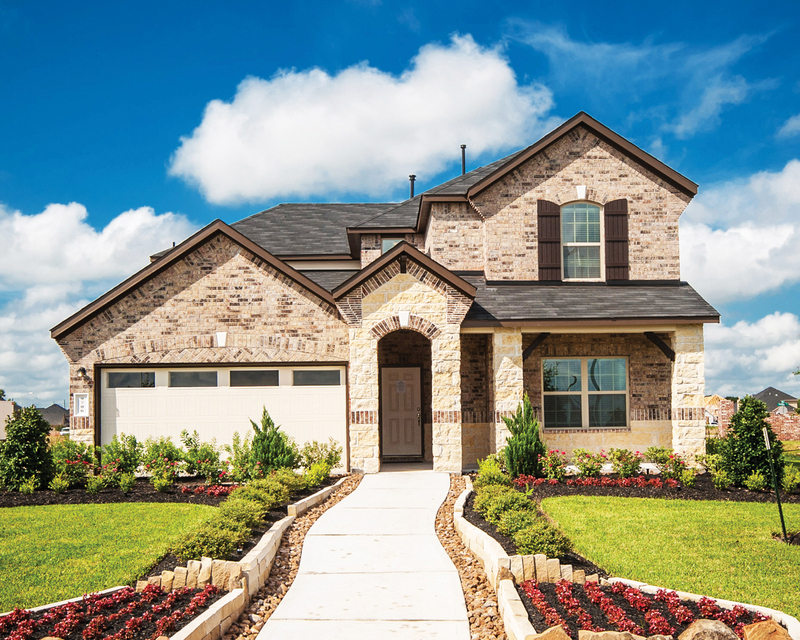 Horton to expand its presence in the Clear Lake master-planned community where the homebuilder has opened a new, fully furnished model home with plans to add 28 new homes, including several on premium, cul-de-sac homesites. D.R. Horton will offer four and five-bedroom plans from 1,700 – 3,374 square feet in the new Tuscan Lakes section of Vittoria, where it is building one and two-story plans on 55 and 60-foot homesites. Priced from the $200’s, plans include gourmet island kitchen, open family and breakfast room, first-floor master bedroom, covered patio, spacious secondary bedrooms and three-car garage. Options such as a fifth bedroom, garden tub/shower and fireplace also are available. The developer’s new five-bedroom model home, fully furnished and decorated, is located in Tuscan Lakes at 2732 Rogliano Lane, where it is open daily, Tuesday – Saturday from 10 a.m. – 7 p.m.; Monday from 1 p.m. – 7 p.m.; and Sunday from noon – 7 p.m.
A master-planned community by The Johnson Development Corp., Tuscan Lakes offers the Cypress Point recreation center featuring a resort-style swimming complex with water features and stone fireplaces. Coventry Homes has opened a fully furnished model home in the Bay Area waterfront community of Edgewater where it will add 56 new homes on 60 and 70-foot homesites. Edgewater, a master-planned community by The Johnson Development Corp., is located at 100 Water St., in Webster near the NASA Parkway Bypass, a connector between I-45 and NASA Road 1. This year, Johnson Development is celebrating its 40th year as one of the nation’s preeminent land developers. Priced from the $350’s, Coventry’s three, four and five-bedroom plans on 70-foot homesites include gourmet island kitchens, open living and entertaining spaces, downstairs master suites, game rooms, spacious secondary bedrooms and three-car garages. Builder options include wine rooms, bonus rooms and outdoor kitchens while a 70-foot Water Street series features rear-load garages. Coventry Homes also will offer three and four-bedroom plans on 60-foot homesites, priced from the $310’s, with many of the same features along with options of a three-car garage, wine room, wood burning fireplace, sun room, outdoor kitchen and Texas-sized patio. Both one and two-story plans are available on the 60 and 70-foot homesites. Edgewater offers new homes bounded by palm tree-lined streets, waterways and a 35-acre nature preserve ideal for bird watching, kayaking and sport fishing. The community also is known for its signature grand entrance featuring a striking bell tower monument. Harris County, the City of Houston and Metro announced on July 23 their respective shares of the $18.7 billion settlement among BP Plc, the federal government, five Gulf Coast states and other local governments to resolve claims arising from the 2010 Deepwater Horizon incident. The City of Houston will receive $12,155,549 for lost hotel tax and sales tax revenues. Metro will receive $9,224,113 for lost sales tax revenue. Harris County will receive $2.1 million for lost hotel occupancy tax revenues. Cities, counties and other governments throughout the Gulf coast had been meeting since July 2 to approve the proposed settlement, which is still subject to the final approval of the U.S. District Court for the Eastern District of Louisiana. The district court had ordered local officials to keep individual amounts confidential until the final approval of the settlement but that order was relaxed this week to allow the city, county, and Metro to disclose the settlement amounts. The global settlement resolved all federal and state claims that came out of the Deepwater Horizon accident and included agreements with Alabama, Florida, Louisiana, Mississippi, and Texas and local governments. BP’s settlement also includes a $5.5 billion civil penalty to be paid over the next 15 years under the Clean Water Act. The City, County, and Metro were among the more than 500 local governmental entities that filed claims seeking to be compensated for economic losses suffered as a result of that spill.